Summer is definitely the perfect season for ice cream and sundaes, but as we all know, kids and ice cream usually equal one big mess! 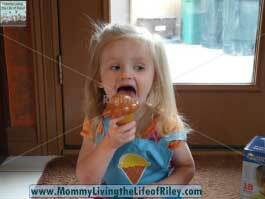 Wish there was a way for your child to enjoy ice cream without the sticky fingers and stained clothing? Now with the Pretend & Play Ice Cream Shop from Learning Resources, they can enjoy playing in their very own ice cream parlor! Keep reading to learn more about the toy set which will have your child serving and eating ice cream every day of the year! 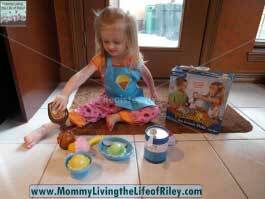 I reviewed the Pretend & Play Ice Cream Shop from Learning Resources, which retails for $26.99, but is currently on sale for $25.16 with FREE SHIPPING. The first thing that impressed me about this set was how durable and well-made all of the pieces were. Even the spoons were made from a very thick and hardy plastic which would stand up to plenty of toddler abuse. Riley's had many toys in the past which were so flimsy that they wore out in a very short amount of time. That is definitely not the case with the Pretend & Play Ice Cream Shop from Learning Resources. Riley couldn't have been any happier with this play set. She loved using the ice cream scooper, which has a small suction cup on the inside, so that it really mimics picking up the individual ice cream scoops. She also loved splitting the banana and concocting various banana splits. Her favorite feature of this play set had to be the chocolate syrup squirting bottle. Even though it only has a dark brown string hanging from the nozzle, Riley absolutely loved "squirting" all of her ice cream treats with syrup. As a matter of fact, she wouldn't let you eat anything without adding plenty of syrup to it first! Riley has been playing with the Pretend & Play Ice Cream Shop for several weeks and hasn't grown tired of it yet. 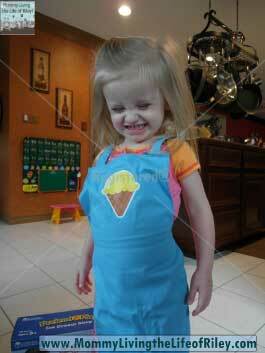 She literally plays with it many times every day and often wears her ice cream apron even when she isn't playing ice cream parlor. I really like her playing with this set for it fosters her creativity, imagination and hand-eye coordination too. Now that's one sweet treat! 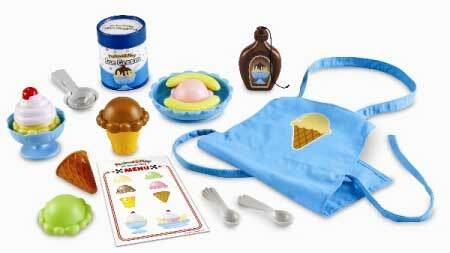 Disclosure: I received the Pretend & Play Ice Cream Shop from Learning Resources in order to facilitate my review. No other compensation was received. This product review is based on my own personal experiences with this item and is completely honest and objective.